This year we were lucky. 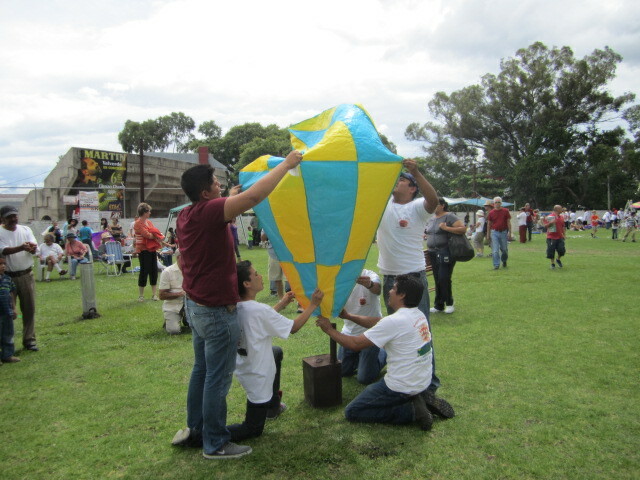 The Globos Celebration came off without rain but as you can see from these photos, the sky was very overcast. The next day it started raining and we have had rain for days now. The gods must have been looking down on us last Saturday to keep the rains at bay for the day. The date was Sept. 14th and the place was the grounds on Revolucion street. In order to save myself a good seat, I arrived almost three hours early. I will have to remember next year. Don’t go before around four thirty in the afternoon. By the time the bigger globos are being put up, I am too tired to stay when I arrive that early. No reason to have a seat in the grandstands anyway. It is better to arrive late and just walk around in the field. You can get much better photos from the field and it is like a giant party out there. 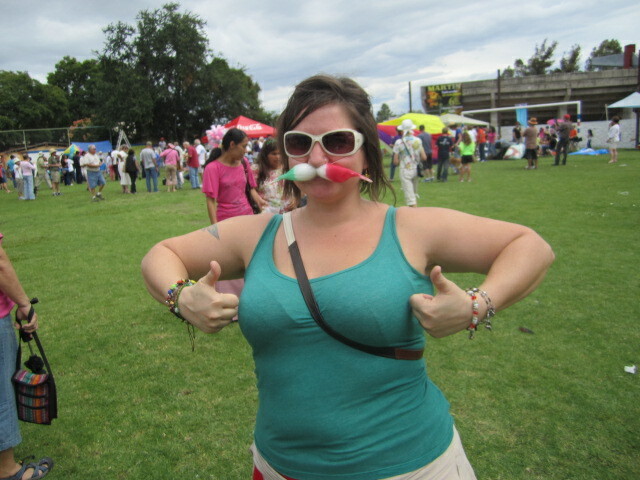 The globos are made out of what is called China Paper. It is extremely thin paper and slick. 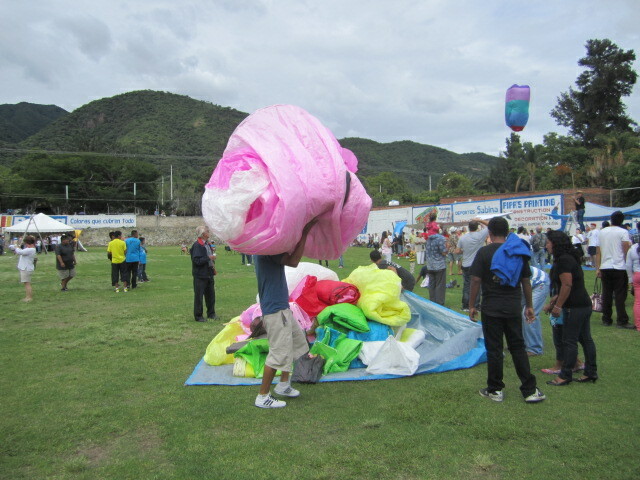 It is light so there won’t be much weight on the globos as they go up but also it burns quickly. The photo above is the globo commissioned by Accesslakechapala.com. Of course, I wanted to put theirs on at the beginning of this article. Since I left before it went up, I don’t know if it survived the launching. 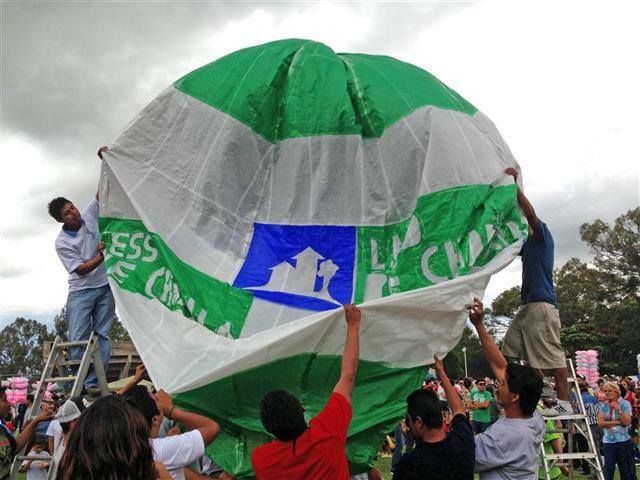 Access paid a group of young people to make this globo for them. Many of the larger ones have the names of their sponsors on them. 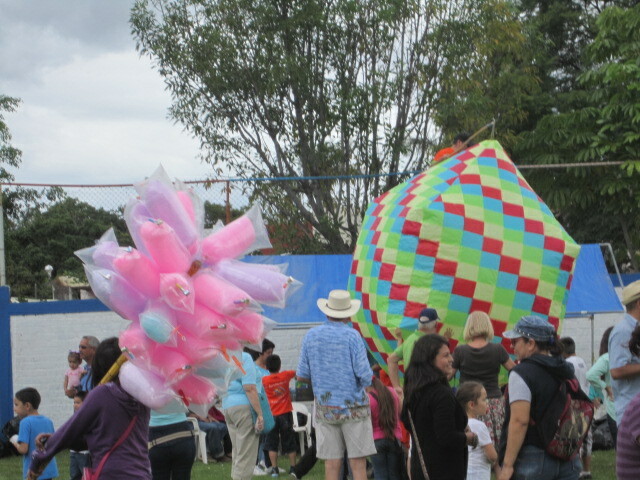 About two hours before the festival gets going, people bring in the globos. Since they are very fragile, it is a difficult task that has to be done with much care. 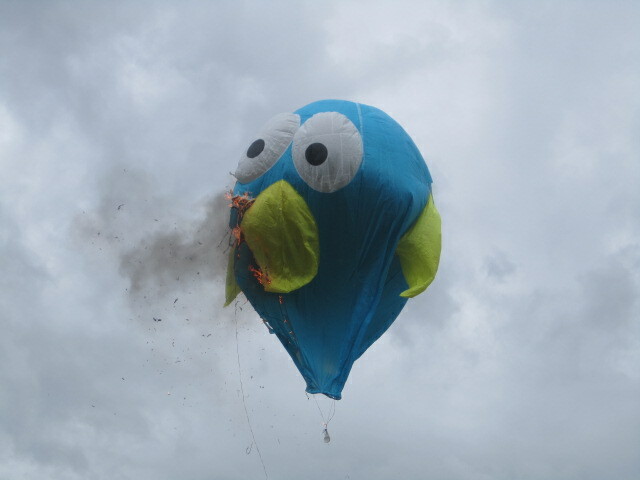 I noticed a couple of them that were already ripping before they were even filled with hot air. 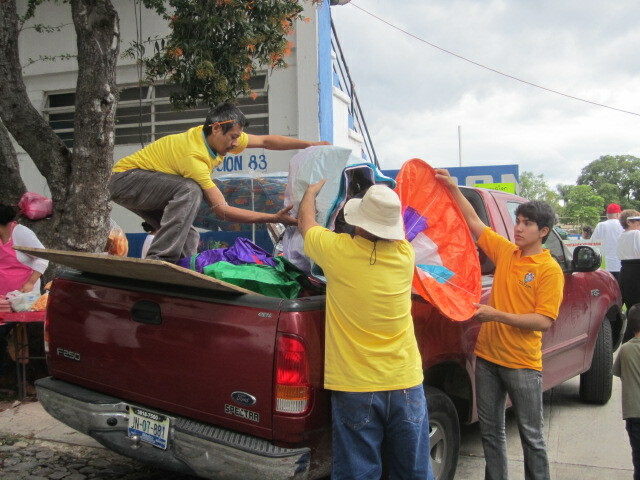 People work on these globos for weeks in advance. It must be a great disappointment for them to see that their globos don’t even make it into the air. You never have to worry about being hungry at the festival. 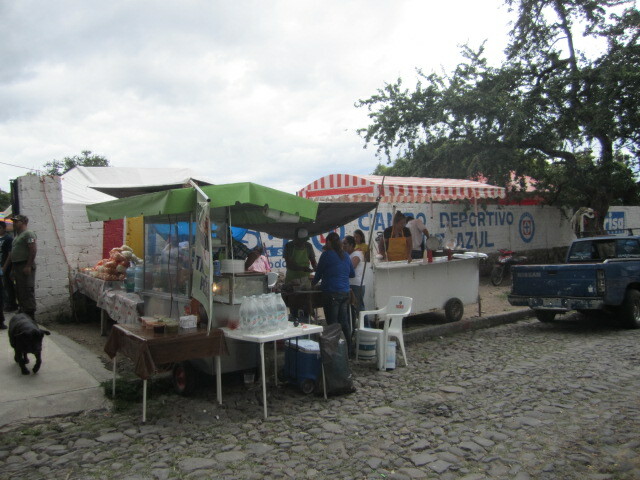 There are food and drink stands everywhere both inside the grounds and outside, on the street. Take your choice; freshly made pizza, pies and cakes, hamburgers, tacos, tamales , hot dogs, popcorn, cotton candy, cokes, beer, fresh fruit, etc. 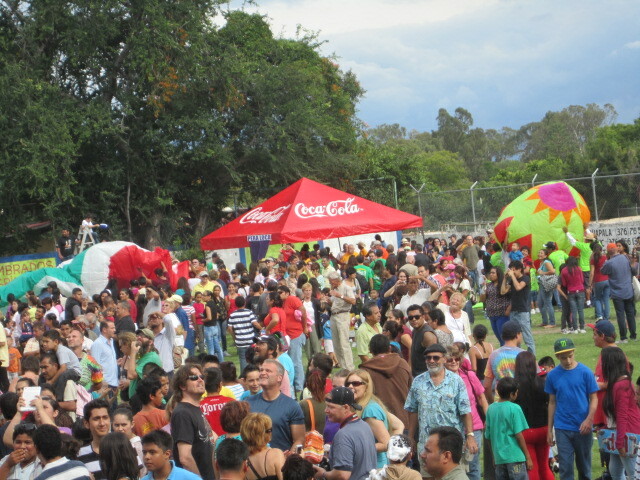 Entrance to the globos festival is free but if you are feeling generous and concerned about it continuing, it is a good idea to make a donation on your way inside. 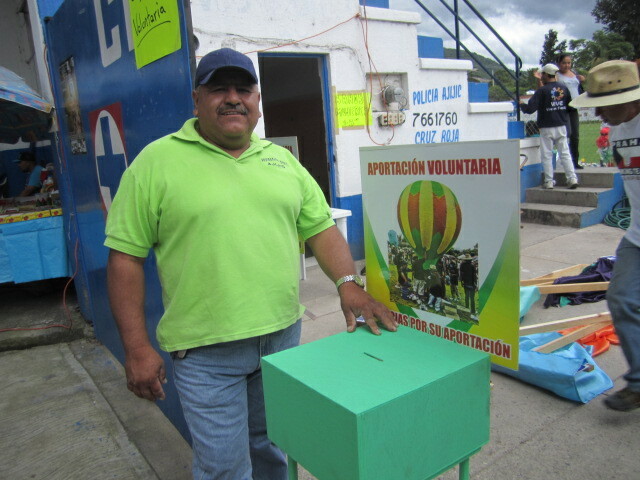 Also, many of the food stands were there to raise money for charity organizations in this area. 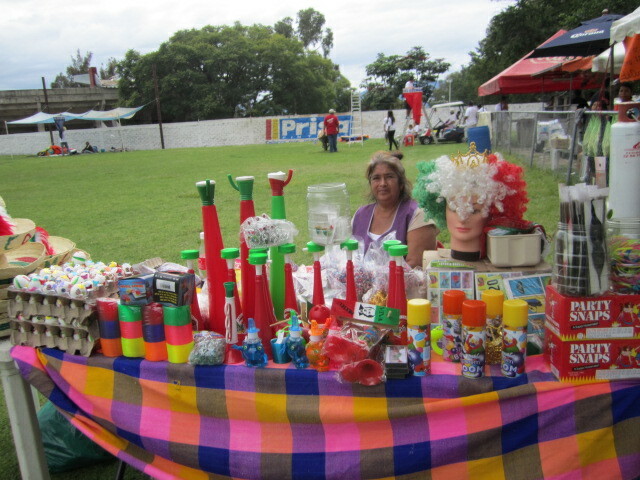 The globos celebration always is at the beginning of Mexico’s Independence Day Celebrations. Everyone looks forward to the big parades, parties and music in the plaza. Unfortunately, the next day after the globos, the rains came and came. No parades. No street parties. Just quiet ,rainy days….. It was a big disappointment. 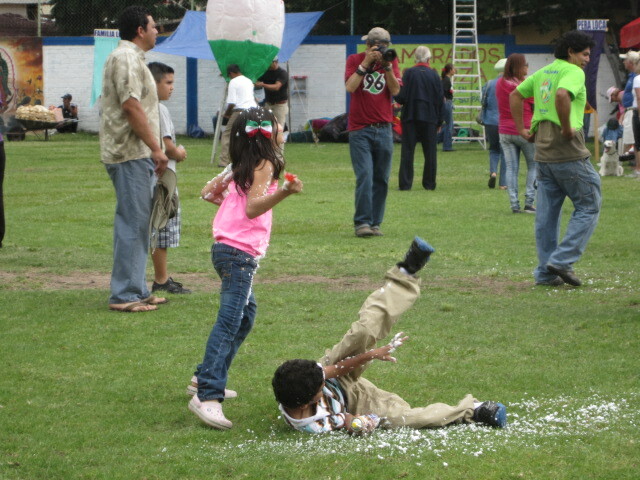 Children were having fun out on the field before the globos started going up. If you look closely in the stand above this photo, you will see colored eggs for sale. Those are filled with confetti which the children love to throw at each other and anyone else passing by. Also, there are cans of soap which you can see the children in the photo above have been spraying on each other. It is always fun to watch the globos being filled with hot air. 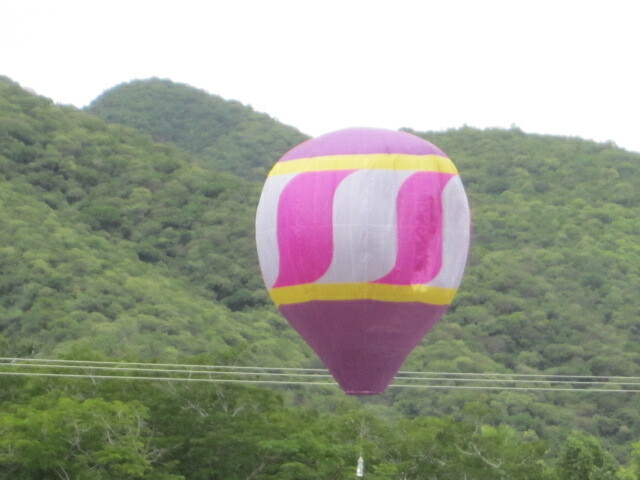 Above is another photo of the Access Lake Chapala globo. Larger ones like this take a long time to fill up and it has to be done very carefully or else they will catch fire and burn up. 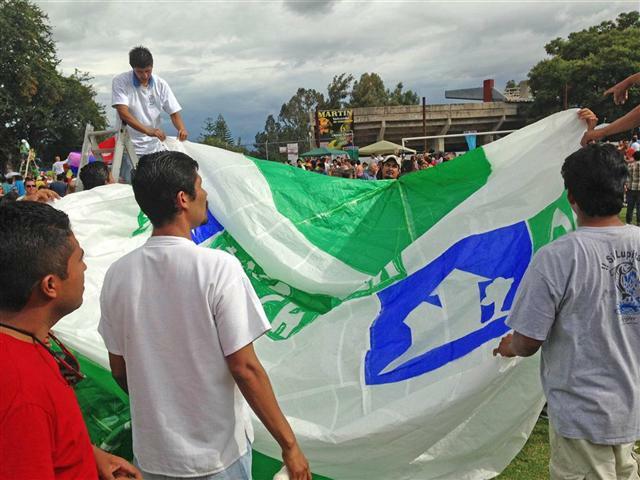 I love the above photo of the young men filling their very small globo with hot air. These smaller ones have a much better chance of making it up into the sky because they don’t bend to the side and catch fire. That is what happens to the larger ones. People in the stands always groan loudly when one catches fire and falls to the ground. And sometimes they fall on the people below. But they cheer when one gets up high. Here are two photos of globos that didn’t make it. I love the expression in the first photo. It is almost as if he were startled to realize that he was on fire. I wonder who created this one. Brilliant. A couple of times flaming globos came down into the stands. My friend and I jumped out of the way. An event like this would never be allowed to happen in the States. Fire marshals and insurance companies would see to that. 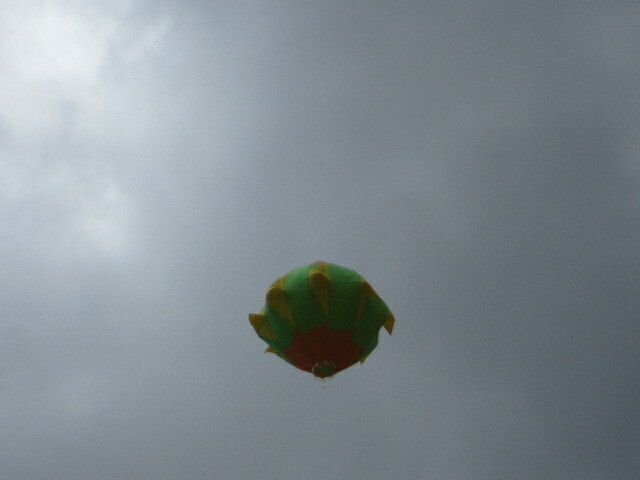 Above is a photo of a medium sized globo that made it up. Once they get up that high, they can go on for miles. Some have even floated to the other side of the lake. Or fallen into corn fields and burned them up. Then the owner of the globo has to compensate the farmer for his crop. No insurance claims here. Everything is done directly, from person to person. 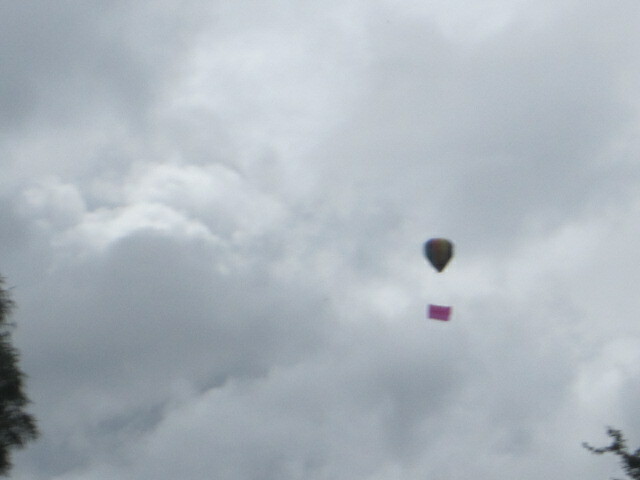 Above is a photo of one of the larger globos that made it up. It was a good shape, a circle, no strange shape. 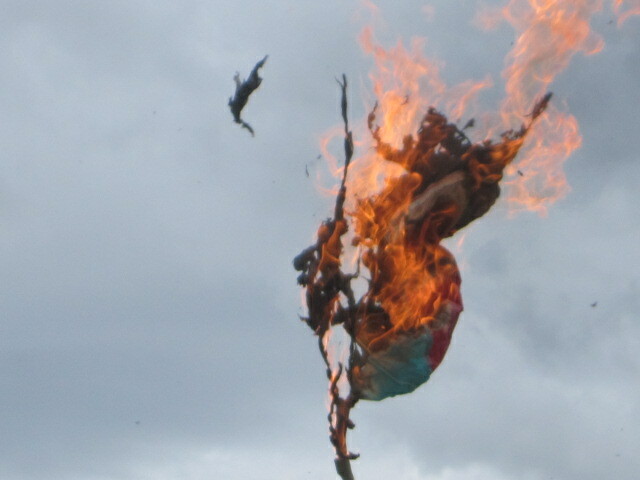 The more interesting ones, shaped like animals etc, quickly burn up because they fall to one side. The above photo was taken during that two and a half hours early that I was there. 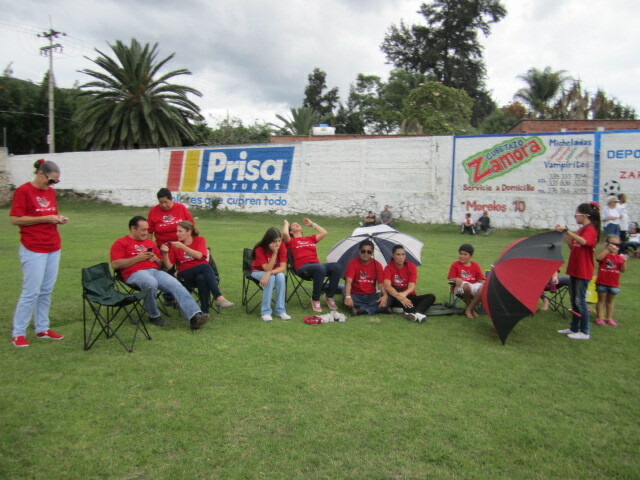 The globos hadn’t arrived yet and the group was patiently waiting. It looks like they may have been worried about rain arriving before their globos. Each group wore one color of t shirts. It was easier to tell them apart that way. Fortunately for all of us, the rain never showed up that day. Above is a pile of globos. You can see by the photo that they can be quite large. They are also light. One skinny young man was able to carry this pink one by himself. 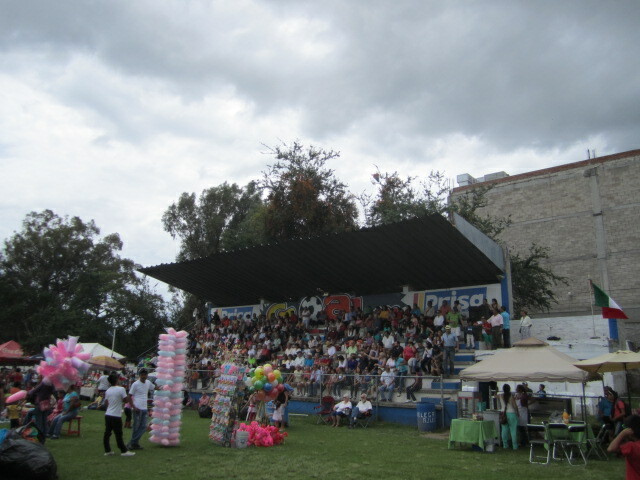 Above is a photo of the stands before everything got into full swing. 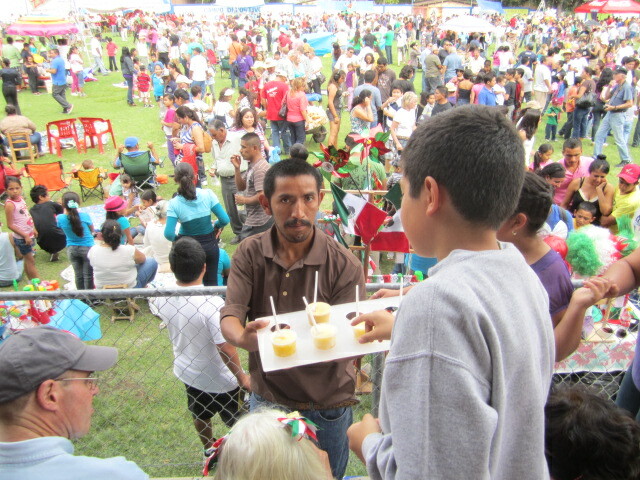 This is one of the most popular events in Ajijic and it is well attended by both the Mexican and the Expat communities. It is a great place to meet up with friends and neighbors. And also to make new friends. 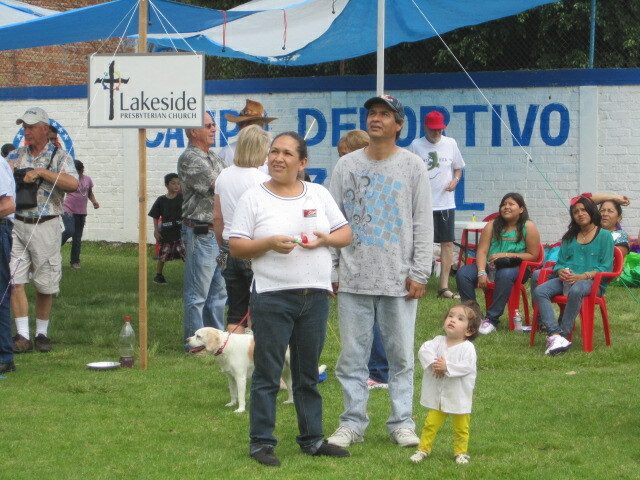 I love the above photo of the little girl looking up at the globos. This is probably the first globo event that she will be able to remember after she grows up. It is a magical event for the children. And for the adults. Everyone seems to be having fun at this event. This nice young woman was happy to pose for me. The cotton candy in the above photo almost looks like one of the globos. Check out the background in the above photo. 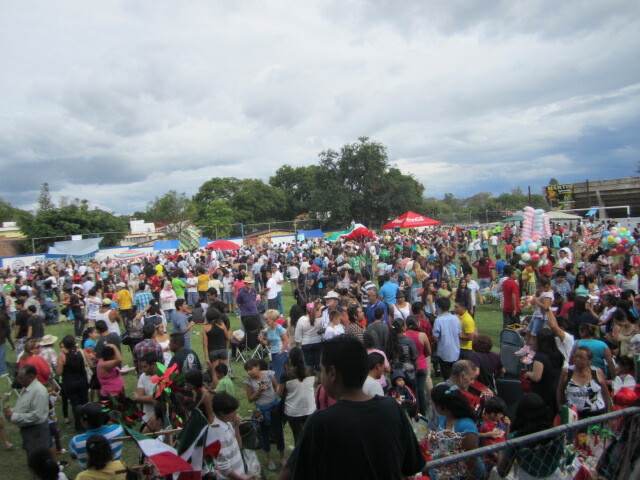 The grounds were packed with people. It would be difficult to avoid a globo on fire falling in that crowd. But no one seemed to be worrying. Just having lots of fun. 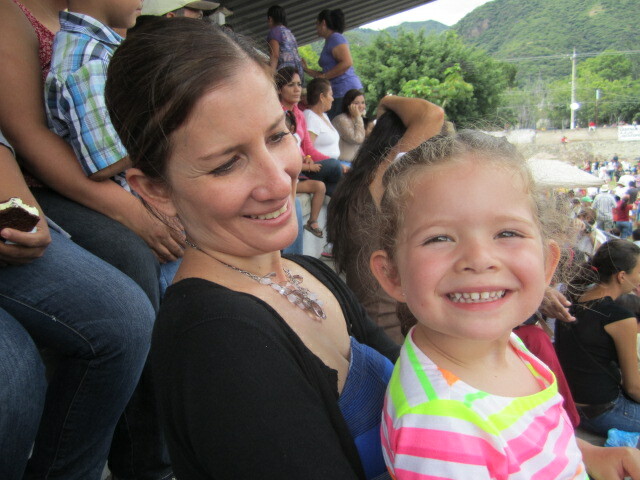 The little girl in the above photo was sitting with her mother and father in the stands. She smiled at me as I took her photo. I love to see children smiling. That smile took away two hours of my back pain from sitting. 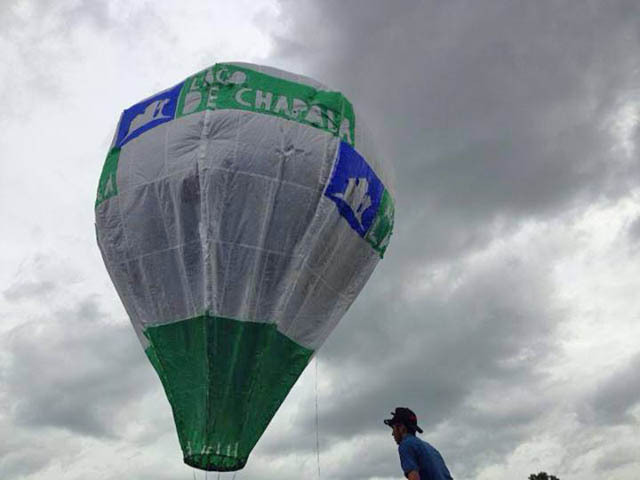 The Access Lake Chapala Globos is being launched in the above photo. The shape and size are perfect for a great flight. I love the colors in the globo in the above photo. Because it was so round and not too large, it made it up. You can see that the mountains in the background are very green from all the rain we have been having here. You can see in the above photo that the crowd is thick. Two globos in the background are being filled up with hot air. Is there really such a thing as having TOO MUCH FUN? Maybe so. 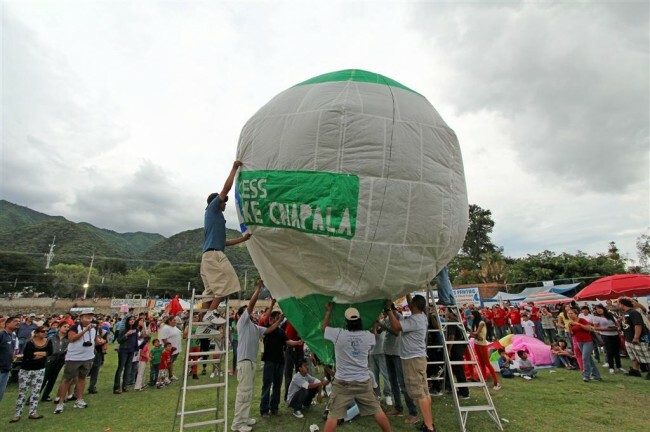 The last anyone saw of the Accesslakechapala.com globo, it was safely launched and on it’s way to towns further east. SUCCESS!